A common design goal of modern digital products is to surprise and delight users, and motion design can be a powerful tool in your arsenal to do that. Entertaining loading animations, gratifying feedback and using motion to lead the eye between transitions are all great ways to elevate your user experience. Sadly, most modern design tools and workflows aren’t set up to let designers actually design those 58 frames. Today’s popular workflows revolve around creating throwaway prototypes used to communicate to developers who then painstakingly recreate animations to the best of their eyes and ability in code. Not only is this a waste of time and resources, but the process is so fatiguing that even seasoned designers and developers end up settling for “good enough” implementations. And if they want to iterate on their designs after trying out a concept, they’re back starting again from square one. Haiku is a modern design tool that empowers designers and developers to build imaginative UI components. Code optional. 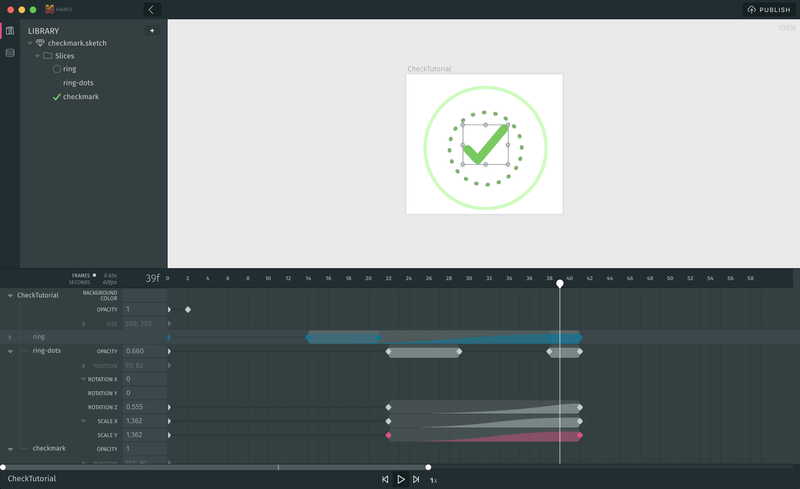 With its visual timeline, it’s easy to design interfaces powered by motion. Everything authored in Haiku is production ready, and once integrated with your codebase you can continue to iterate on your designs. No hand off necessary. Before we roll up our sleeves in Haiku, it’s useful to think about how we want to translate our designs into motion, by thinking like an animator—in time and space. If you’re new to motion, one simple way to do that is to storyboard. When storyboarding, try not to get hung up on small details — a lot of the magic in motion happens when animating and iterating on your designs visually. Just figure out enough to get started. Watch the video tutorial or read on if you’re more of a GIF person. In Haiku, there’s 2 ways to work with Sketch— you can either import an existing Sketch file or create new designs from scratch. The boilerplate Sketch file contains more instructions — we’ll cover them later. Whenever a property is edited, Haiku automatically creates a keyframe where the playhead is positioned. Think of keyframes the same way you would frames in our original storyboard. Entering accurate properties ensures a 100% seamless loop of our bouncing ball. Everything created in Haiku is pure JS/CSS ready to snap into any web app, with native renderers for iOS & Android powered by Lottie. If you’ve made it this far, you should probably sign up for the private beta if you haven’t already. If you have any questions, feel free to reach out in the comments below.